Sorry no updates over the last week or so. I've been so busy with work and everything else that I haven't had time. I plan to have a good catch up on blogs sometime soon, so sorry for my lack of comments! And as a follow on from my last post, no sooner had I moved the two silkies out of their arc, another hen went broody. She kept it up for a few days so I decided to separate her off from the others and put some eggs underneath her. The eggs are just from my chickens here, so no pure breeds, but it will be interesting what they turn out like! Not a happy hen when I chuck her off her eggs for a drink and a feed for 5 mins a day! Nearly two weeks in so hopefully my little girl will have some chicks to play with soon. I've been wanting to get my bantams out of their little ark for a while now. I want to have the ark in reserve in case I get a hen that goes broody, it also needs some maintenance and a new coat of wood stain. So I decided to build them another little coop. I made most of it out of the old shed I housed my ex caged birds in over the winter so the cost were next to nothing. I had great ideas of making a "chicken weeder" that I could put between my rows of brassicas or fruit bushes and the two little chickens would weed them for me. Because of this I built the run and the coop separately so I could move them on my own easier. In reality the outside run is too narrow for my liking and it would be awkward to get between plants, so instead I've fenced off a weedy area of the veg garden that I was leaving fallow this year for them to have a scratch about in. The coop is still an alright size for these little chickens (and there's a nest box area at the back) I think they'll be fairly happy in their new area and when the soft fruit is over they can go in there and keep the bugs down for me. When we moved here I was a little anxious about meeting the one next door neighbour. He'd rented the fields we'd brought for the last 20 years so I was worried about what he'd think with how I was going to run the place. Luckily we hit it off straight away and have become good friends. I think he's glad not to have the responsibility so much now (he looks after the land from the "big house" next door as well). There's a farm gate between his garden and my field and many a good tail has been told over it, like generations of country folk before us. He does seem to like the orchard I've planted down below our garden (and quite near to his) and last week he offered to top it for me to keep it looking tidy and to let him try out his topper on his tractor. I wasn't going to say no. All I need to do now is strim around the trees. Having good neighbours can really make or break the place that you call home (especially ones that don't moan at me for working late!). My wife was somewhat unimpressed when I came home from work on Saturday with another cockerel. "We don't need any more" she said, I'm not even sure we need the two we've already got . This guy is big and tough though. The only survivor from a workmates fox massacre. Last year I brought some herbs to replace the ones I'd left at our last house. From these I took cuttings from and divided up to make more plants (all in hundreds of pots which need watering). 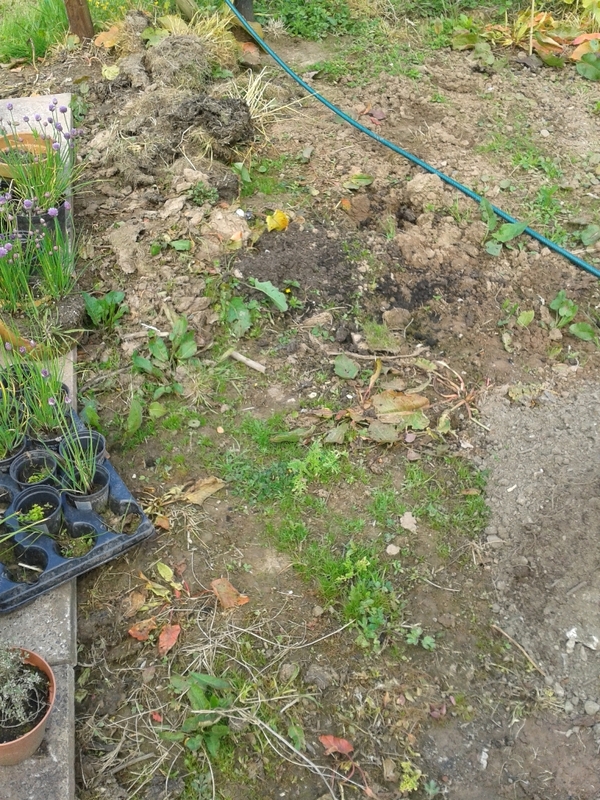 My idea was to have a large herb area in the front garden, but I've got bigger plans for that at the moment (more on that later) so I decided to get them out of the pots and make an area to house them in the veg garden. The first bit by the gate has been looking a little scraggy for a while now so I decided to give it a little make over. 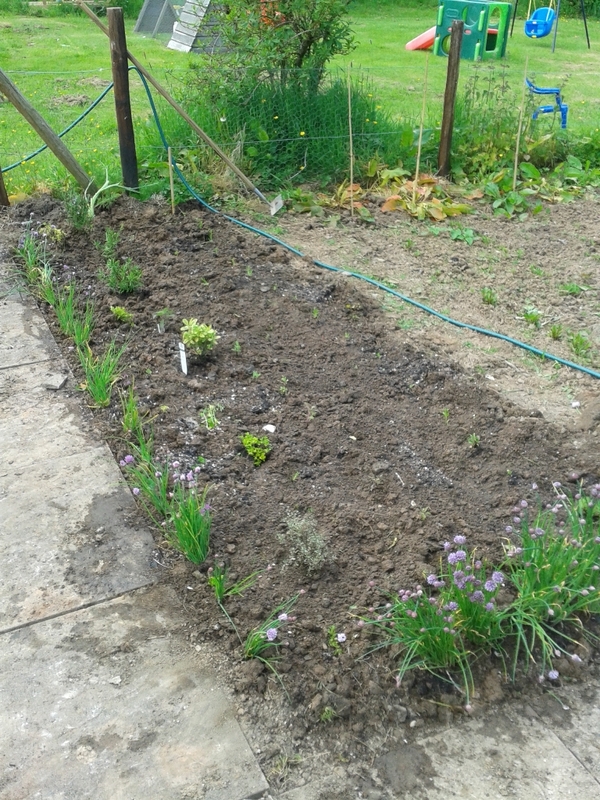 I had over 25 chive plants to make a boarder around the outside (all just coming into flower so it should look nice) and then thyme, sage and rosemary were planted in the middle, many to these from cuttings I took in the autumn. The back edge was then planted with a line of lavender plants, although I'm fairly sure they're not going to stay there it will be a good place to grow them on until they're ready to be moved. Now I could just do with some lambs to go with the rosemary!